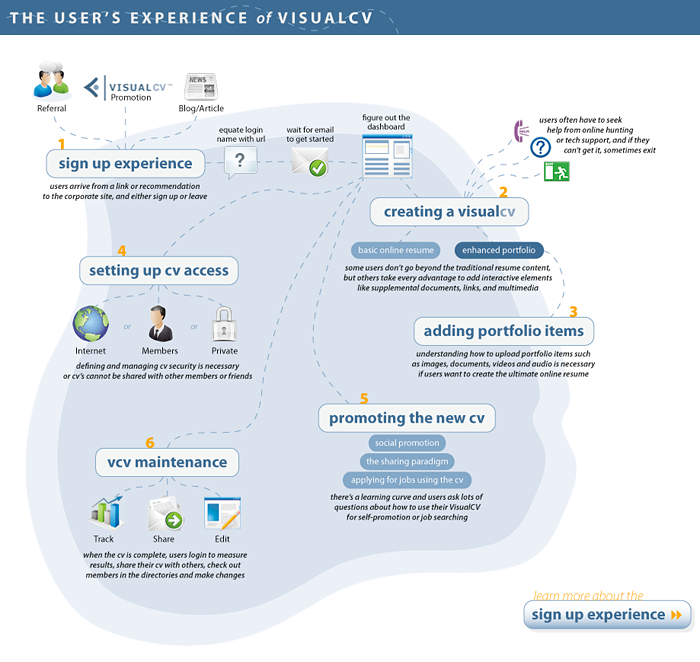 A Journey Map is what it sounds like: I cover the steps the user takes from start (pre-sale demo or first mention) to cancellation or potential EOL of the product, and create a visual depicting this journey to help educate stakeholders and identity areas that need to be improved. For Fresh ID client Visual CV, I identified potential stopping points so they could keep new users engaged throughout when setting up a resume online as users were struggling. 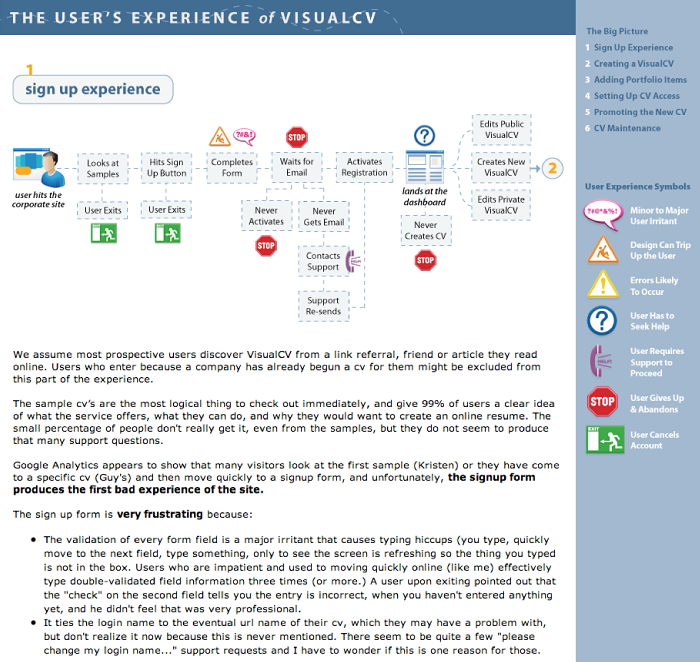 Because there were so many pieces to this user journey, this was designed as an HTML site on their internal servers, but you might present this as a single diagram or a PDF document. We shared this with many stakeholders so having a url made it easier. 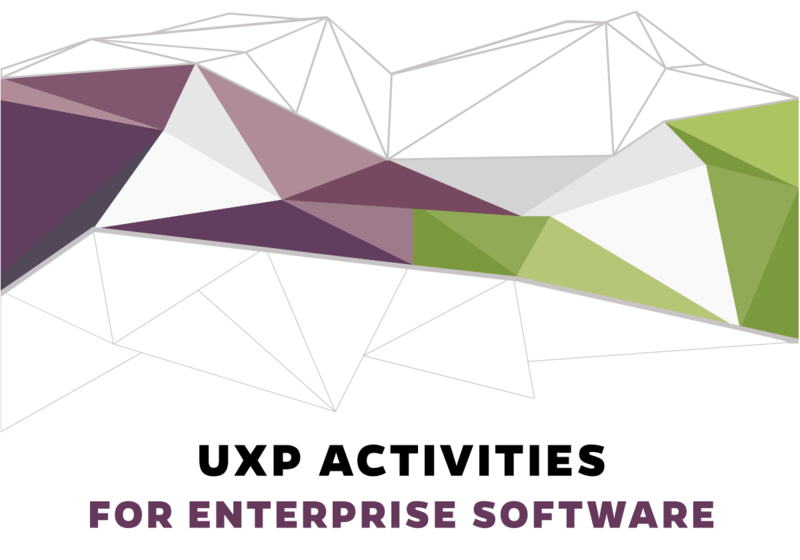 This first diagram could be viewed as a high-level Information Architecture, because I defined this (put these things into categories of user tasks) while going through the experience. For developers each working on their piece without understanding what the whole experience looks like, this could be a good document for you to create for any task-based app or site. 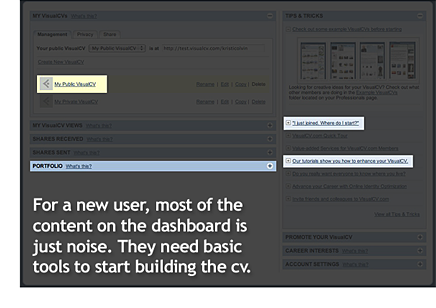 In context of potential problems I saw that I was trying to make better, this screenshot pretty much sums it up: getting a VisualCV set up was just too complex for the brand new user. Do you have similar troubleshooting you could do in order to make the user’s journey or experience of doing tasks better? I need to make these icons into something that can be downloaded and will try to find them or create new ones and do that.